Time to dust off the Ham Radio category, which hasn’t been used since February, 2013 just a few month after we had moved into our rental property. Since that time the SteppIR BigIR has been quiet with no operating activity since August, 2012. Currently there are not even control cables connected. Just a quiet shack and I vertical raised. Nearly 2 years have passed since that time with the hex beam mounted on a tripod in the backyard. That all could be changing shortly with the purchase of my first tower. While I haven’t operated, amateur radio is a hobby you can walk away from and return to without missing much. I know conditions while off the air have been terrible, so I haven’t missed much. Sure there have been DXpeditions and contests nearly every weekend, but once I get the antenna situation sorted out, I will fire up the rig and be back on the air, providing I get the okay from the XYL and more importantly I have some time. Last week I read an email that was forwarded from Vic, K2VCO was was selling a US Tower MA-40 Series Tubular Tower. This had been a tower I had wanted since it would work very well with the hex beam I built. Unfortunately at $1500 it wasn’t really something I could add to my Christmas wish list. I had seen this sort of tower offered a few times on the NCCC Reflector, but never could rustle up the money or time, but always inquired. This time around, I emailed Vic, asked a few questions but told him I could not pay for a few days. He said there was someone else interested, but if they didn’t get him the money he would email and let me know. As luck had it, the other party seemed to back out and the offer was on the table. The price of this used tower, $200! How could I pass it up? Even if I don’t put it up now, at our rental this will still be perfect for the hex beam when I get around to making repairs and raising the tower. 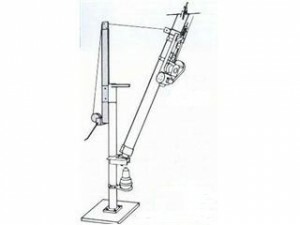 The MA-40 is a tilt-over, crank up tower that has a maximum of 40′ and is just 21′ when retracted. So next week I am off to Fresno in a 24′ U-Haul truck to pick up my new tower. While it might inspire me to actually fix the broken fiberglass spreader arm, I will have check with local regulations on erecting this. I don’t know if the city requires any permits for a 40′ structure, but it’s something I will need to investigate. The second consideration is room in the backyard. With two 10’x10′ cages for my wife’s Bengal breeding, I am not sure I have the necessary room without rearranging the backyard and pouring more concrete to lengthen the patio. Regardless, I am excited to be adding this piece of hardware to my station. Progress has been made! I was able to finish up some items on my wife related to do items and put some time into working on getting the SteppIR BigIR installed. It’s been October since I last operated in a contest (CQP) and with very little free time to play radio, getting aluminum in the air hasn’t been a high priority. I spent about 15 minutes digging a hole that would then be filled with concrete surrounding a metal support mount that the SteppIR BigIR would be mounted on top of. I spent a few minutes aligning 2×4 pieces of wood that held the 24″ metal post in place, in the center of the hole. I mixed up some concrete and began pouring. In just a few minutes I was rinsing out the bucket, washing off the tools and letting the concrete dry. I figure I will check it on Sunday, at which time I will place the SteppIR BigIR in place. There was other work that had to be accomplished before getting on the air. I had to cut the control cables from the antenna end when we moved in December. It took about 45 minutes, but I was able to rewire the control cables and reattach them to the SteppIR BigIR. Hopefully by Monday or Tuesday I will be able to get some ground radials in place and begin configuring the antenna for use. I am still aiming at May and the CQWW WPX CW contest as a return. I am still undecided on how to get the hex beam in the air. After being on the roof attaching my weather station, I won’t take the chance to climb on the tiled roof again. Safety is a huge concern and I am not ready to chance it. That leaves me very limited. I am still looking at possibly at attaching a mount to the facing that hangs down off the roof. This would possibly allow me 25-30′ in which to raise the antenna. Right now the hex beam is about 7′ high sitting on a larger tripod. Obviously NOT ideal, but sometimes we must go with what we have. The last option is to raise another 4×4 post in the ground and attach the mast to the 4×4 pole and raise the hex 15-20′ into the air. It seems the true tower options are just not viable right now. I thought I had a lead on a 55′ crank up, tilt over tower but the work to get it down and moved, only to possibly not have it installed, I could not justify following through. 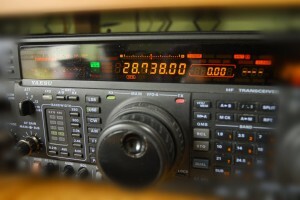 It’s now a race against the clock, as the CQWW WPX CQ Contest begins next Friday at 0000z (5pm PDT). With any luck it will get there as late as Friday and I should be set to operate up to 36 hours of the contest. Not that I will be able to stay awake, which has been a problem in the past. I spoke about this contest on April 4th in WPX on the Horizon. Not having a radio has put some of my planned worked on hold. I was able to fix my vertical antenna, thanks to SteppIR and remount it in the backyard. Unfortunately with my knee surgery and no transceiver, I have not been up on the rooftop to see what work needs to be accomplished on the hex beam. With any luck, it will plug and play and I will be able to get on the air quickly, if needed. Again, this is dependent on the arrival of the radio back to my house. As for the contest, I will provide one further update later next week to summarize my goals. If I can put in a full effort and solar conditions are better than what I have seen the past month or so, I should be able to pull off my goal from 2010 of 1 million points. This would be far and away my best showing in any contest I have entered since 2009.